Sets up in less than half the time of conventional means, easy to transport to distant locations. Using the Air Wall or our Overhead Inflatable on your next production is a wise decision. This new patented technology will not only save you time and money but it is environmentally friendly and reusable. Aircover will coordinate with the visual effects team, production designer, and DP to help layout and budget for your outdoor screen needs. From site inspection to installation we will be there for you through the whole process. Our dedicated team will help you solve your overhead diffusion problems with a safe and budget conscious solution. No day before pre-rig is necessary. With a 2hr set up time the Aircover overhead can show up on the day, Position the crane, place your tie downs, hook up to the Overhead and turn on the air and you are in business. The motors are attached to the overhead so all you have to do is run the cable along the arm of the crane. 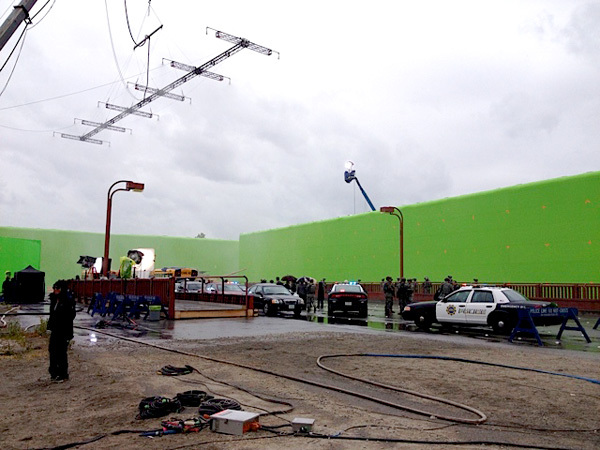 Need a huge outdoor green screen? Let us give you an alternate solution. With a greatly reduced pre-rig and wrap time and with no wasted materials the Airwall can be set up in less than half the time of traditional methods. Please Contact us for more information or a quote.
" I was so impressed when I first saw the designs for the inflatable green screens. I am honoured that Godzilla is the first major production to use them as I know they will become the industry standard. " " The AirWall is Amazing! I have to admit I was skeptical at first, a blow up green screen? Never! But after setting up almost 600’ wide by 34 feet high, I am now SOLD! "